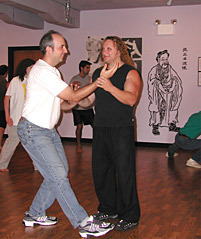 Internal Arts, Tai Chi Chuan (Taijiquan) Classes . At the end of N. Main St. (Providence) bear left at the fork. We are in the new Hope Artiste Village. Make a left at the end of the building onto Warren Ave. Go up the wooden stairs and enter the building. Internal Arts is the first door on theleft.